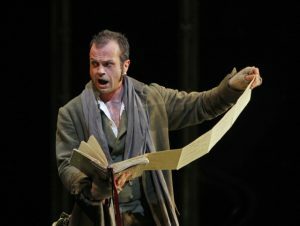 Lucas Meachem (Don Giovanni). Photo by Cory Weaver. Saturday’s opening performance was neither a Thumbs Up nor a Thumbs Down event, and while there is much to say about elements of the production, the overall experience is difficult to summarize. Shawn Mathey (Don Ottavio) and Ellie Dehn (Donna Anna). Photo by Cory Weaver. As Nicola Luisotti began to conduct the overture, the sound from the orchestra was unusual, and some of it stayed with the performance for three hours, until the Finale caught fire. This was Mozart with a light touch, measured, precise, and understated. 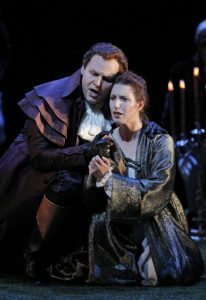 Neither elegance nor passion was always in the fore, certainly not the way the two played against one another in San Francisco’s last “Don Giovanni,” four years ago. Both in conducting and playing the fortepiano recitative accompaniment (with Bryndon Hassman, harpsichord, and Thalia Moore, cello), Luisotti maintained an admirable consistency of tempo and balance, producing a “classical Mozart” sound. At times, it came close to the tedious, but always returned to the straight and narrow. Little to fault, not too many true highlights. U.S. debuts of director Gabriele Lavia, set designer Alessandro Camera, and costume designer Andrea Viotti were mixed affairs. At times, Lavia went for commedia dell’arte hijinks; more often, he had the singers stand stock still, arranged in tableau vivant. At first, Camera’s two dozen large mirrors and an equal number of Louis XIV-like chairs made a strong impression against the otherwise empty stage, but when the huge (16×6 feet) suspended gilded mirrors began to come and go in a busy and virtually constant choreography, the distraction could not be justified. Viotti’s costumes were fair enough, although the floor-length overcoats brought back some uncomfortable memories of Regieoper uniforms. 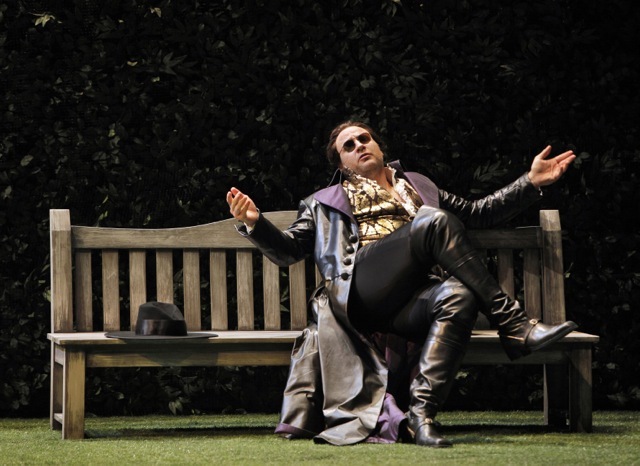 Sunglasses for Don Giovanni? Why not? Marco Vinco (Leporello). Photo by Cory Weaver. In the title role, Merola/Adler veteran Lucas Meachem presented a self-confident anti-hero, both smooth in seduction and rough in action. He sang well, especially in soft passages that featured the lyrical beauty of the voice, but when the music required helden-baritone, the sound wasn’t always there. There was an unusually large number of debuts in the cast, and the standout was the smallest role, that of the Commendatore, sang with restrained but resounding power by Morris Robinson, a newcomer to the War Memorial the audience clearly wanted to return soon. Marco Vinco’s Leporello was vocally, dramatically, and comically outstanding. Kate Lindsey, a true singing actor, ate up the role of Zerlina, using every part of her body, in addition to her impressive vocal cords. Serena Farnocchia’s Donna Elvira and Shawn Mathey’s Don Ottavio made a good, if not vivid impression. Returning artists included Ellie Dehn as a fair Donna Anna and Ryan Kuster as Masetto. 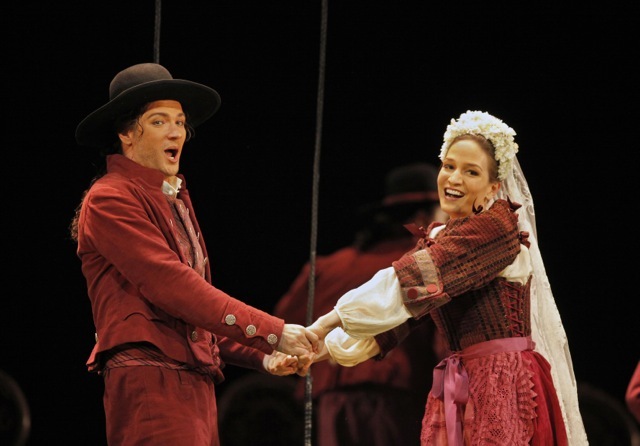 Ryan Kuster (Masetto) and Kate Lindsey (Zerlina). Photo by Cory Weaver. 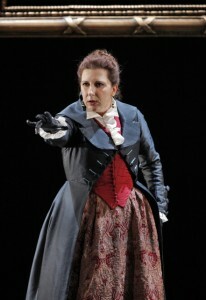 Serena Farnocchia (Donna Elvira). Photo by Cory Weaver.